The second of these seasonal re-inventors was a a New Yorker. Clement Clarke Moore was a university professor specialising in divinity and theology, who had written a number of very dense (and probably very dull) academic texts before he became famous for another style of writing entirely. 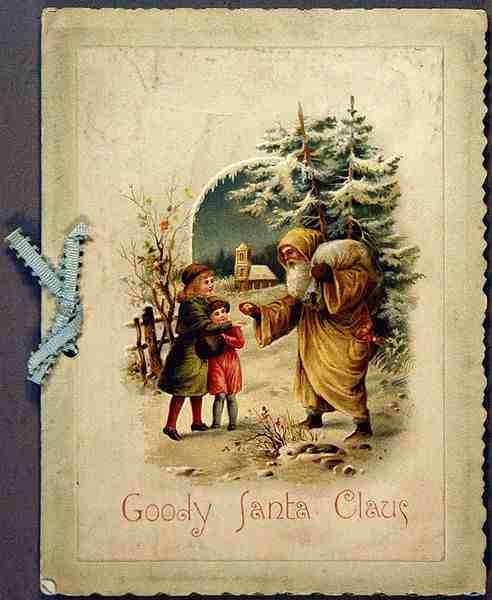 Said to have been written at Christmas 1822 for his children, Moore’s most popular work is the memorable poem known as either A Visit From St Nicholas or ‘Twas The Night Before Christmas – and its importance lies in the fact that it was one of the earliest, and certainly the most successful, of all the depictions of Santa Claus that defined him in an instantly recognisable modern style. Moore was, apparently, reluctant to publish the poem, fearing its ‘frivolous’ subject matter would damage his academic reputation, but it was leaked to the media anyway and the rest is, as they say, history. Ironically, his concerns for his reputation appear to have been well-founded – it is the only thing Moore is remembered for, although remembered and much loved it is. Much parodied over the years, and recently the subject of a controversial but possibly correct re-attribution (to one Henry Livingston Jr), the original poem is still a festive favourite on both sides of the Atlantic, evoking nostalgic and sentimental images of the classic Victorian Christmas celebration. The final member of this festive trio (and the only Brit) is, of course, Charles Dickens. His hugely popular and vividly realised seasonal writings, particularly A Christmas Carol, hark back to an almost imagined past to define Christmas as a cheerful, snowy time of family, generosity and forgiveness. But there was always realism amongst all the sentiment. The themes of poverty, class and redemption run though A Christmas Carol, and it very clearly demonstrates the differences between a Victorian middle class Christmas and that celebrated by the vast majority of the population. ‘Why, bless your heart alive, my dear, how late you are!’ said Mrs Cratchit, kissing her a dozen times, and taking off her shawl and bonnet for her with officious zeal. Despite an ever-growing consumer market, many Victorian women, like Mrs Cratchit, would have made (through choice or necessity) their own Christmas gifts, decorations and treats. Sugar plums were a particularly popular sweet treat during the 19th century, and were often made to be hung on the Christmas tree or to be placed into a decorated box and given as a gift. 1) Drain the plums. Put the sugar in a large bowl. One by one, roll the plums in the sugar until they are fully coated. Place the plums on a baking tray and put them to one side for half an hour. Then roll each plum in the sugar again. 2) The Victorians would have put the plums on a hot range to gently dry out over the course of several days, but drying them in a modern oven is just as effective. The plums should be put in the oven on its lowest setting and left there for a couple of hours until all the juice has seeped out of them. 3) Take the plums out of the oven and coat them in sugar again. Transfer them onto another, clean baking tray and put them back in the oven as before. Then you’ll need to repeat the whole sugar coating and oven drying process another three or four times over the next couple of days, placing the plums on a clean baking tray each time to catch any juices. 4) When the plums are completely dried out and the sugar is nice and crispy, these sweet treats are ready to eat – or to decorate with. If you want to hang them on your tree, simply thread them onto cotton using a needle. Place them in a pretty gift box or a Victorian-style keepsake box if you’re giving them as a present. You ought to seriously consider writing a small Christmas book. The thought has crossed my mind, I must admit. It would be fun to write too!